There are promo pics of dolls that were going to happen! Meeshell with color change hair, deluxe Farrah, Holly and Apple with getting fairest accessories and budget Maddie, Raven and Darling. They were posted on Tumblr. Just...wow! Omg, I LOVE that Meeshell doll! Holly is really pretty too. So sad they'll never happen. I do love the articulation! Sweet Treats didn't even get that. Meeshell and Farrah look great in this line. I would have liked to seen different characters and new accessories though. Now I wonder if Ghostly Tea Party and Howling Hoodies aren't meant to happen either. I would have gotten Meeshell, Holly, and Raven. They're so pretty! It's kind of sad that near the end, EAH did some cool looking things, even with budget dolls. Holly & Apple PLUS some good-looking accessories!!! Probably better for my pocketbook. But not my heart. Alas, fair maidens! That Farrah looks nicer than the sig one. Yes! So does the Meeshell even though she still doesn't have her true hair color. SO I'm just gonna go cry in a ditch. Oh god, that Farrah and Holly! C'mon mattel, I dont care if they got reprints of old stuff, these dolls are gorgeous! Dont cut us off from these! That hair color looks amazing on Meeshell. The outfit on the Farrah doll looks familiar ( maybe from a webisode?). Thank you for posting the link, RenegadeAngel. I both love and hate it when we get leaks of awesome products that will never be because their respective lines were canned. The same thing happened after Disney Infinity was cancelled. The dress is Hearstruck Cupid's. Lol, it's not enough that they're using recolored accessories, now were using recolored clothes. At least it looks good in blue. Also, Apple's dress is her Wonderland dress and I think Holly's is Ashlynns's Legacy Day. When they couldn't even released a cheap Getting Fairest and reused fabric (Farrah only has two dolls and you're doing that...), you know they mismanaged this property. It's still a prettier Farrah than her sig. Honestly the whole EAH situation reminds me a lot of what I've read happened with Jem back in the 80s. Like Jem, EAH was pricier than what else was currently on the market and failed to catch on. Like Jem, EAH had a well written animated series that was probably more popular than the actual dolls. 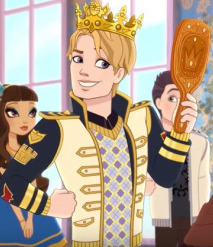 And, like Jem, EAH was stymied by efforts from their main competitor using well known characters, in this case ironically Hasbro with Disney Descendants. I wonder if like 20 years later Mattel will put out some collector dolls (Since Mattel does their own collector dolls unlike Hasbro who refuses to tap that market so they had Integrity do them instead) to cash in on the nostalgia and also try to release a really bad live action movie that has little to do with the original premise. Well at least one thing I hope for is that with all the talented customizers in the community we will at least see the prototypes come to life sooner rather than later. Except for the basic dolls, they all looked pretty sweet. It's really disheartening to see what we could have gotten.